Chapter 10: An Animal is not to be Sacrificed for Allaah in a Place where Sacrifices are made to other than Allaah. Do not stand [for prayer] within it – ever. A mosque founded on righteousness from the first day is more worthy for you to stand in. Within it are men who love to purify themselves; and Allah loves those who purify themselves. 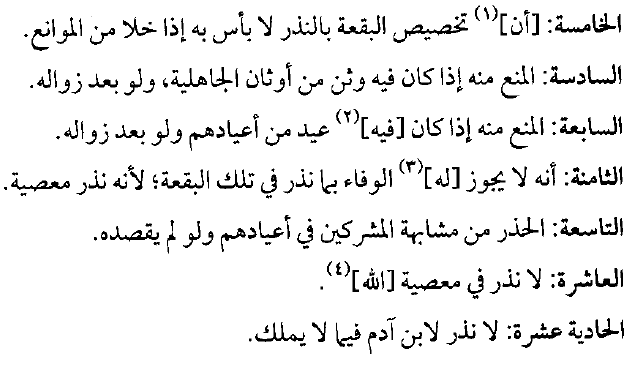 From Tahaabit Ibn Dahhaak (radiyallaahu `anhu) who said: A man vowed (nadhara) that he would sacrifice a camel at Buwaanah, so he asked the Prophet (salallaahu `alaihi wassallam) concerning that. Reported by Abu Daawood, and its chain of narration meets the conditions of the two Saheehs. Do not stand [for prayer] within it – ever. 2. Acts of disobedience have an effect in the land, and likewise is the case for acts of obedience. 3. Referring a difficult issue to a clear issue so as to remove the difficulty. 4. The Mufti may offer clarification in an issue if there is a need for that. 5. There is no harm in specifying a particular location to carry out a vow as long as there is nothing preventing that. 6. 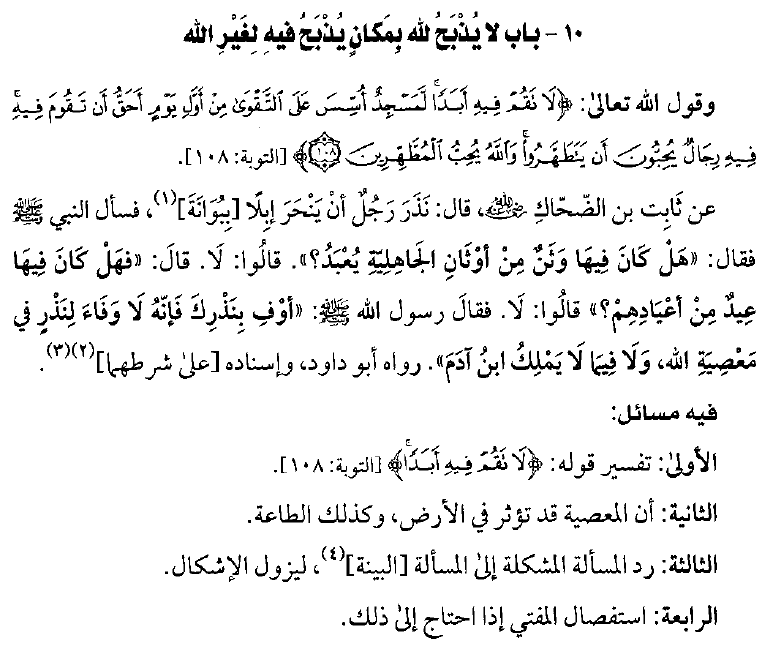 It is prohibited from carrying out a vow in a place if there is in that place an idol from the idols of Jaahiliyyah – and that prohibition is the case even after their removal. 7. It is prohibited to carry out a vow in a place where the polytheists celebrate festivals – and that is the case even after they have ceased. 8. That it is impermissible to fulfill the vow at that place, because that is considered as a vow upon disobedience. 9. A warning against imitating the polytheists in their festivities, even if one does not intend [to worship what they worship]. 10. There is no vow to be made if it involves disobedience. 11. There is no taking of a vow for the son of Aadam in that which he does not possess [i.e. has ability over]. And [there are] those [hypocrites] who took for themselves a mosque for causing harm and disbelief and division among the believers and as a station for whoever had warred against Allah and His Messenger before. And they will surely swear, “We intended only the best.” And Allah testifies that indeed they are liars. And that which is clarified in these verses is the despicable nature of those people, and their scheming against Islaam and the Muslims. Once the Prophet (salallaahu `alaihi wassallam) returned to Madeenah, he sent someone to burn down that Masjid after these verses were revealed. From this it can shown that the places of worship set up for other than the worship of Allaah – then in such places it is forbidden to offer Islamic acts of worship. And that is because, by doing so, you have given life and revived the places of Shirk or Bid`ah or given life to the forbidden places – places wherein war against Allaah and His Messenger is made. So this is the connection between the chapter heading and this verse. From Tahaabit Ibn Dahhaak (radiyallaahu `anhu) who said: A man vowed (nadhara) that he would sacrifice a camel at Buwaanah, so he asked the Prophet (salallaahu `alaihi wassallam) said concerning that. When there came to Allaah’s Messenger (salallaahu `alaihi wassallam) the one who took a vow (nadhr) that he would slaughter a camel at a place called Buwaanah, the Prophet (salallaahu `alaihi wassallam) asked him: “Is there [or was there] in that place an idol from the idols of Jaahiliyyah that was worshipped, or a festival from their festivals? So the man informed him that those things did not take place there. So then the Prophet (salallaahu `alaihi wassallam) said to him: “Fulfill your vow.” Because had it been the case that an idol from the idols of Jaahiliyyah were being revived or a revival of a festival from the festivals of Jaahiliyyah wherein they would worship other than Allaah, then the Messenger (salallaahu `alaihi wassallam) would not have commanded him to fulfil the vow, rather he would would have forbade him from fulfilling the vow in such a place. 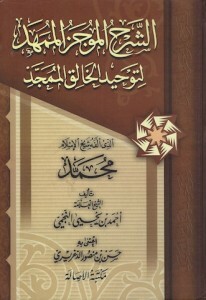 That is that if a person binds himself to taking a vow, and he directs it to the worship of Allaah, however he wishes to fulfill it in a place where a festival from the festivals of Jaahiliyyah were performed, or there was in that place an idol from the the idols of pre-Islamic ignorance – then is it the case that obligation of fulfilling the vow falls away in totality? Or is it just the fulfillment of it in that place so there remains the obligation upon the one who took the vow to fulfill it in another place that is free from these reprehensible matters? This requires looking into. The fulfilment of the vow is an obligation, so if he is prevented due to the manner of its performance, then he is not prevented from fulfilling it completely from what is apparent to me. Rather he should fulfill his vow in a place that is free from the worship of others besides Allaah.